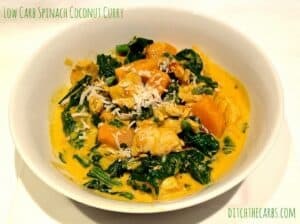 Low Carb Spinach Coconut Curry - simple recipe to try today. 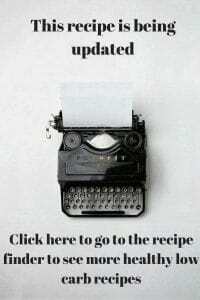 This recipe has been updated. Click here to see the latest new and improved recipe. Even easier to make and even easier to follow. Packed with vibrant colours and flavours make this easy recipe a great family meal. 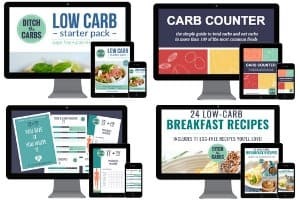 It is extremely low in carbs, high in fat, wheat free, sugar free, grain free, paleo, primal, you name it, and it is absolutely packed with vegetables. Either serve it in bowls with a garnish of coconut thread, or serve with cauliflower coconut ‘rice’ . You can see a theme here, as a family we love curries. My children love them, and I must admit, they loved the popadoms, naan bread and apricot chutney that would be served along side, but they haven’t really noticed those things don’t appear any more. Curries are an easy way to add more vegetables. Pumpkin is lower in carbs than say potatoes or sweet potatoes. It adds flavour, colour and texture to this dish. Spinach is the most wonderful leafy green vegetable packed with vitamins, fibre and antioxidants. Magnesium, iron, zinc, calcium, Vit A, B, C, E, K, manganese, tryptophan, copper. Low carb, paleo, primal, wheat free, sugar free, grain free and........ packed with vegetables. Heat the olive oil in a large saucepan and gently cook the spring onions and curry paste. Add the diced chicken breast and continue to stir until cooked but not browned. This will ensure the meat is still tender. Add the coconut cream/milk and pumpkin cubes, then mix gently. Cover the saucepan with a lid and simmer on a low heat for 20 minutes. Stir occasionally so the coconut cream does not start to stick to the bottom of the pan. Just before serving, add the chopped spinach and stir gently for 2-3 minutes to let the spinach wilt. Serve in bowls with coconut threads on top or can be served with cauliflower coconut rice. Coconut cream/milk- each brand varies widely in their fat content and thickness.This recipe uses coconut cream which is the consistency of double cream. Some brands of coconut cream are so thick you have to spoon them out of the can. Don't use this type for this dish. Instead use a coconut milk. The chicken has to simmer in the coconut, so it can't be too thick or it will burn. Fresh pumpkin is really expensive where I live (Middle East). Could I use frozen pumpkin cubes for this, and just let them thaw before using? Yes that would work. I love reading and learning from all my readers across the globe. Here in NZ pumpkin is relatively cheap to use, and I remember when I lived in the UK, friends thought I was very strange cooking and eating pumpkin, as they had only seen pigs eating pumpkins! My US friends use it in almost every recipe imaginable. How wonderful how different we all are. We often make a similar curry, using the super veggie bok choy, and sometimes poach a little halibut or other mild fish in the pot… it’s very tasty with some cilantro and / or pepitas on top too. So healthy! Thank you for you lovely praise, I’m so glad you have found my website. As for the chicken, you could easily use beef or lamb. They would be lovely, tasty and tender with the creamy coconut sauce. Serve with coconut cauliflower rice. This is one of my go-to recipes: I cook a big batch and use leftovers for lunch and/or freeze it. As I’m a very lazy cook I cut some corners: I use frozen spinach (whole spinach though) and instead of cauliflower rice I just pop cauliflower florets into the steamer when the sauce is simmering. I use solid coconut cream and add water. The benefit of this is that it still has coconut bits in it that make it chewy (which I like) and that I get to control the thickness by adding more water (or cream) if I find it too thick. It’s a very easy recipe that lends itself for experimenting. Oh and my colleagues are always jealous when I bring this to work as they can smell it from meters away. Hi Libby, I’ve just made this for my adult son and I and he couldn’t stop raving about how nice it was and how much flavour it had. He’s asked for it to be added to our “must make again” list! Brilliant!!! I’ll mark that down as a success then 🙂 You have a very discerning son with impeccable taste.